This tells the story of the life of a rabbit. How they are born, where they are born, and even what they need to learn to be safe. The mother rabbit teaches them all they need to know in order to be safe. The little rabbit ate lettuce and was caught in a trap and becomes a pet. Even though the little boy cares for the rabbit, she escapes and returns to her brothers and sisters! This is a cute story, but I can't see a lesson being shaped around it. It would be a good read alone book because it is rather lengthy. I think this was my sister's book; our daddy read it to both of us. I remember the cloth cover being a dull pink, though I might be mistaken. 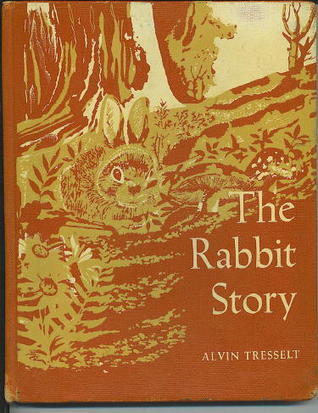 The illustrations were in sepia tones. We read the version illustrated by Carolyn Ewing.